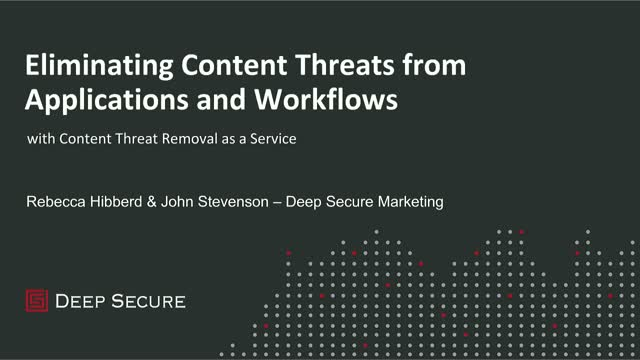 •Learn how Deep Secure Content Threat Removal as a Service (CTRaaS) delivers 100% threat-free digital content - eliminating the threats AV cannot even see – with no scanning, no sandboxing and no waiting! •Understand how it is accessed via cloud APIs specifically designed to make it easy to integrate with your applications and workflows. See for yourself how easy it is to penetrate any cyber security defence that relies on detection based anti-virus tools. Discover how you can eliminate zero-day threats in Web content. By adding Deep Secure to an existing McAfee Web Gateway the organisation’s Web users can enjoy 100% threat-free digital content.